Brian Sommer is of counsel with IME Law, PC, where he represents influencers, brands, leading talent, companies and financiers in traditional, interactive, and immersive media industries. Written by Brian Sommer. Sommer is of counsel with IME Law, PC, where he represents influencers, brands, leading talent, companies and financiers in traditional, interactive, and immersive media industries. Beauty retailer Sephora had a good thing going with influencer Olivia Jade Giannulli. Since 2016, numerous Sephora-sponsored posts appeared on her Instagram channel. The relationship was likely proving worthwhile for Sephora, because in December 2018, they debuted an Olivia Jade x Sephora Collection. In addition to the sponsored Instagram posts, Giannulli portrayed a carefree and lavish college lifestyle to her 1.4 million Instagram followers. The partnership seemed to be going well, until scandal struck Ms. Giannulli. On March 12, 2019, news broke that Ms. Giannulli’s famous parents, “Full House” actress Lori Loughlin and fashion designer Mossimo Giannulli, were among other affluent parents charged by the U.S. Justice Department with participating in a nationwide college admissions bribery scheme. According to the indictment, William 'Rick' Singer and his purported college counseling business, known as 'The Key', allegedly recruited and bribed college coaches and college admission test proctors to aid with getting the children accepted to prestigious colleges and universities. Mr. Singer used two main schemes: one involved manufacturing bogus standardized test scores, and the other was to create fake athletic profiles for the prospective students, because student athletes frequently face lower admission standards than students not participating in collegiate sports. According to court filings, Ms. Giannulli’s parents allegedly paid Mr. Singer $500,000 to have Ms. Giannulli and her sister designated as accomplished rowers so that they would be considered sought-after recruits for the University of Southern California (“USC”) women's crew team. Neither of their daughters allegedly participated in crew, yet Ms. Giannulli’s father submitted a photo of her on an ergometer rowing machine to supplement her profile as a purported crew coxswain for the L.A. Marina Club. Ms. Giannulli’s college application was submitted to the USC subcommittee for athletic admissions in November 2017, and she was formally accepted to USC in March 2018. 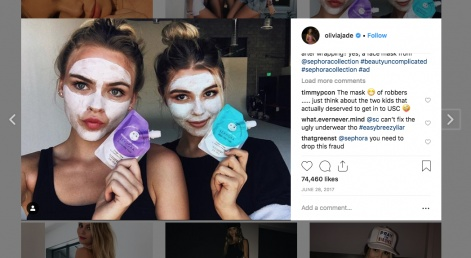 In the two days following the wake of the scandal, shoppers flooded the Olivia Jade x Sephora Collection product review pages with scathing commentary, calls for Sephora to stop working with Ms. Giannulli and boycott threats. Sephora has since removed any reference to Ms. Giannulli or the Olivia Jade x Sephora Collection from its website. It has been over a week since the scandal made news, yet numerous posts promoting Sephora and the Olivia Jade x Sephora Collection still remain posted on Ms. Giannulli’s Instagram feed. As of March 19, 2019 six of the last 32 posts on Ms. Giannulli’s Instagram account are sponsored posts for Sephora, and commenting continues on these posts. The vitriol in Ms. Giannulli’s Sephora-sponsored Instagram posts is rampant, with many comments critical of Sephora’s association with Ms. Giannulli. Despite Sephora’s press release announcing the partnership with Ms. Giannulli has been terminated, Sephora remains connected to the controversy so long as the Sephora-sponsored ads remain posted on Ms. Giannulli’s Instagram account. This is especially true if commenting continues on these posts. My presumption is Sephora overlooked this part of its influencer damage control strategy, because it otherwise does not make sense why Sephora would remain associated with Ms. Giannulli when it announced last week that the partnership was immediately terminated. Although there is no perfect public relations response for a brand in the wake of an influencer controversy, there are some contractual strategies brands can take in order to lessen the fallout. The simplest step is to have a term in the influencer contract that entitles the brand to demand the influencer to immediately remove sponsored posts for any reason and at any future point in time. Care must be taken when drafting the contract to ensure the contractual right is enforceable by the brand regardless of whether the sponsored post is five days, five months or five years old. There are Sephora-sponsored posts on Ms. Giannulli’s Instagram account from well over a year ago that have negative comments related to the present scandal. Another way brands can try to mitigate their losses is through a contract term that entitles the brand to prevent, or claw back, the influencer payment if a morality clause is breached. A morality clause describes a certain level of decency the influencer must maintain during the posting period or contract term. If the influencer is connected to something scandalous, for example, the situation surrounding Ms. Giannulli, then the immoral act can serve as the triggering event to claw back or avoid payment to the influencer. One social media marketing executive speculated that Ms. Giannulli may have been paid upwards of $50,000 per Instagram post. While $50,000 is a relatively small amount for a global brand like Sephora, this sort of contractual right can make a difference to a smaller brand with limited cash flow. The relationship between Sephora and Ms. Giannulli is probably more complicated, because the two may have had a licensing contract for the Olivia Jade x Sephora Collection that is a separate and distinct contract from the contract for sponsored posts. In situations where influencers and brands have two different contracts between one another, it is common to include a cross-default clause in each contract. Essentially, a cross-default clause means that if one contract is in default, then the other contract is also deemed in default. Cross-default clauses can be another effective way to manage an influencer crisis. The fallout from Sephora’s decision to cut ties with Ms. Giannulli and to stop sales of the Olivia Jade x Sephora Collection will likely have no measurable impact on its customer base or financial performance. Sephora operates over 1,900 stores in nearly 30 countries worldwide generating over an estimated $4 billion in revenue. This incident is nothing more than a slight blemish on the company’s otherwise healthy complexion. 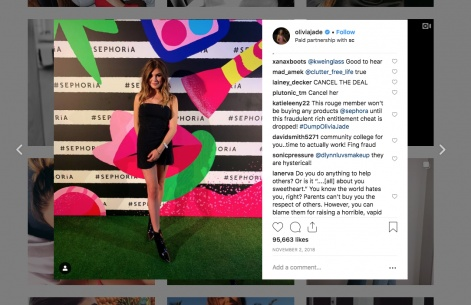 For brands with relatively limited capital or that extensively rely upon one influencer for endorsement marketing (essentially, a brand spokesperson), a scandal like this can have a profoundly negative impact. Sales could plummet, brand perception could diminish and customers could express their grievances on brand social media accounts. That is why brands are well-served to have contract rights and a comprehensive contingency plan in place to counter the effect of an influencer turned infamous. Meanwhile, Sephora may be unwittingly incurring avoidable bad publicity through Ms. Giannulli’s Sephora-sponsored active posts.